A Primer on Today’s Missional Church. 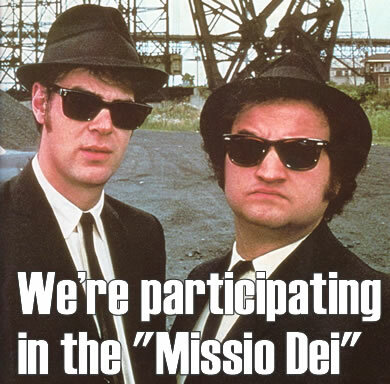 Wondering what all the fuss is about with this word “missional”? No, I didn’t think so . . . but if you were, JR Woodward has uploaded a whopper post with a gizillion links to all things missional. Worth a link and perhaps a bookmark. My posts on the subject, none worthy of making JR’s list but worth reading anyway, include “What I mean when I say “emerging-missional church”, “Whatever and Missio Dei”, and “Missional Synchroblog: The Skinny on Missional” which traces the history of the word back to 1883. You are right there in his links to missional bloggers, though! Thanks for the HT, I’m glad you found the post helpful. I thought the links you mention here are extremely helpful so I added – The Skinny on Mission and What I Mean when I say Emerging-Missional Church. Thanks for your labor and example in these areas. Peace. Thanks – very useful links. Fantastic pic! I need to make a shirt with that on it.